This article explains how to restore an image of an MBR system disk to a GPT disk that supports the newer UEFI booting standard. UEFI (the Unified Extensible Firmware Interface) is an interface between a computer's firmware and operating system. It is designed as a replacement for BIOS (Basic Input/Output System). 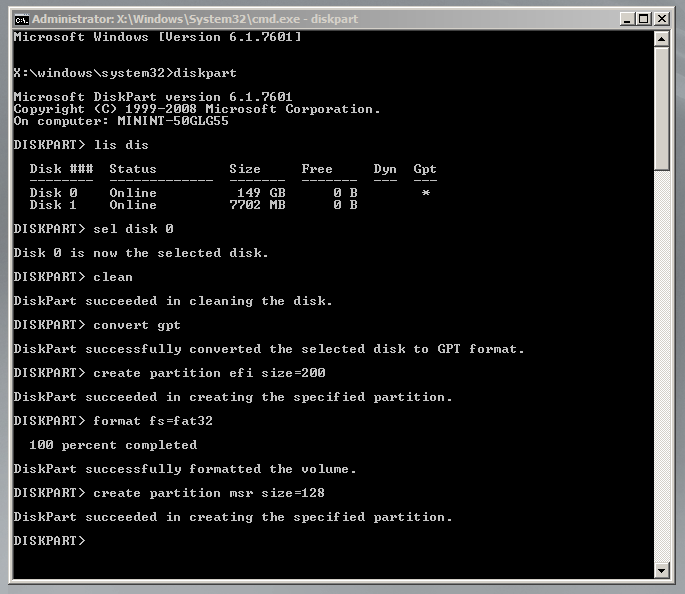 UEFI supports hard disks with either MBR (master boot record) or the newer GPT (GUID Partition Table) system. GPT is a newer standard, that supports disks larger than 2TiB and allows for more than four primary partitions per disk. As UEFI and GPT become more widespread, older images of MBR disks will often need to be restored to replacement UEFI / GPT systems. This article assumes that, apart from the type of disk, there are no other hardware differences between the system being imaged and the system being restored to. For dissimilar hardware, Redeploy may be needed. Rescue media created with v5.2.6249 or later on Windows 7/8 operating systems will be dual boot. That is, they will boot in both MBR and UEFI mode. Please boot your rescue media in UEFI mode. Consult your Motherboard user manual for information on how to do this. Note: To open a command window click the icon on the taskbar. In Macrium Reflect, click the Backup tab and then click Refresh to read the newly initialized disk. Click the Restore tab, select the image file, drag and drop the imaged partitions but DO NOT restore the MSR partition from the image file. In the example below only the C partition was restored to the target disk. Once the restore has completed you'll need to configure the UEFI boot files in the EFI system partition. Note: You may need to edit the UEFI configuration to tell it to boot into the new GPT hard disk. Article has been viewed 128,808 times.